Home: What is Entering Canaan? Taking its name from the Exodus experience of the Jewish people from slavery into the Promised Land, Entering Canaan accompanies those who have suffered abortion on a journey into the Promised Land. Those who join in this journey of faith, find hope and confidence while addressing the impact of abortion spiritually, emotionally and psychologically. They also learn that regardless of how long their healing takes, or how many battles of healing they need to engage in, they have a community of people to whom they can turn in time of need, many of whom have gone before them facing the very same battles and who will be there for them unconditionally, to encourage them on the way to true healing . Beginning the Journey: Days of Prayer & Healing, planting the seed of hope for those hurting. Fighting the Battles: Monthly Gatherings (groups) addressing specific post abortion issues. All retreats include witnesses of mercy, personal prayer, sharing and quiet time, as well as an opportunity for the Sacrament of Confession and the Holy Sacrifice of the Mass. Entering Canaan is a ministry of healing from abortion, developed by Theresa Bonopartis with the Sisters of Life. It has been expanded over the years by Theresa and the Franciscan Friars of the Renewal to include, men, siblings and couples who abort due to an adverse diagnosis. Is there anything like this in the UK? Thank you for all that you do. I am just learning about your work and see that you work with the Sisters of Life. We were blessed to meet some of the sisters over the Fourth of July weekend while at the Divine Mercy Shrine in Stockbridge. Fr. Seraphim arranged for us to share the work we do with those sisters that were present. 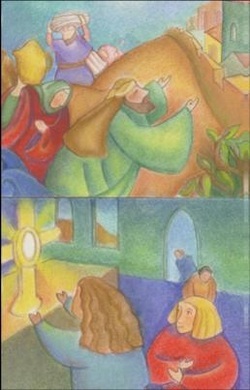 You can see the picture on our website on the rotating bar on our home page at http://www.prebornjesus.com. I am mostly interested in discussing with you a means of praying for those affected by abortion through a new prayer tab we will be adding to our site. The petitions will be prayed at the Divine Mercy Shrine in Poland. Please contact me.